Depending on who you ask, Twitter is either a complete waste of time or a lifeline that has saved the day on more than one occasion. I for one have found Twitter to be extremely helpful on many occasions for answering tough questions, or providing insightful feedback to ideas. Twitter is also a great resource to turn to for help with your Thanksgiving festivities. If you are the one planning, cooking, and making everything happen this Thanksgiving and you find yourself needing some help, or you’re in a bind and stuck on finding a recipe, then Twitter might be your best friend this holiday. 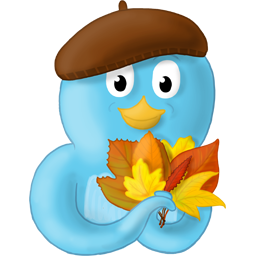 Twitter did a great write up on their blog and compiled a list of resources (Twitter profiles) for you to follow if you are in need of everything from Thanksgiving recipe ideas, to questions about what you’re cooking. Direct any cooking question to @foodpickle and their community will answer it before you can say “preheat your oven to 350”. Famous chefs like @markbittman, @davidlebovitz, @michaelpollan and @tylerflorence tweet about life inside the kitchen, and you can almost smell the food cooking in kitchens around the world through accounts like @wednesdaychef, @chefgui and @vindee. Get 140 character recipes from @cookbook, or follow outlets like @latimesfood, @saveurmag, @slashfood, @FoodNetwork, and @fandw for bite-sized tweets of foodie news and info.